The Black Rosy-Finch is a medium-sized, slightly stocky finch of about 14 to 16 cm in length and 22 to 32 grams in weight, with a medium-sized bill for eating seeds. The sexes are similar in size and coloration, but the male plumage contrasts more and is more colorful. Males are a uniform dark brownish-black on the back, breast, neck, and face below the eye. The feathers of the belly, rump, upper- and under-tail coverts, and the bend of the wing (wrist) are broadly tipped with pink (more narrowly and reddish in summer). The forecrown is black; there is a silver-gray band around the hindcrown. The nasal tufts are white, and the tail is notched. The bill is yellow in winter and black during the breeding season. The legs are black and the under wings appear silvery during flight. Females are similar but with the body a lighter grayish-brown, the back more streaked, and the pink feathers reduced or absent; the gray on the hindcrown is often absent by midsummer. Juveniles are similar in appearance to females, but lighter (usually more gray-brown), and lacking the silver-gray hindcrown, black forehead, and pink on the feather margins (Johnson 2002). The Black Rosy-Finch is most likely to be confused only with other rosy-finches. The Gray-crowned Rosy-Finch is much lighter and brownish overall, with more extensive pink to red feather margins that contrast less with the brown plumage. The Brown-capped Rosy-Finch lacks the silver-gray on the head and is much lighter and browner-bodied (almost golden in males). Ranges of the three species rarely overlap during the breeding season (Johnson 2002). The Black Rosy-finch is mainly an altitudinal migrant, but many move south and east 200 to 450 km beyond the breeding range (Johnson 2002). 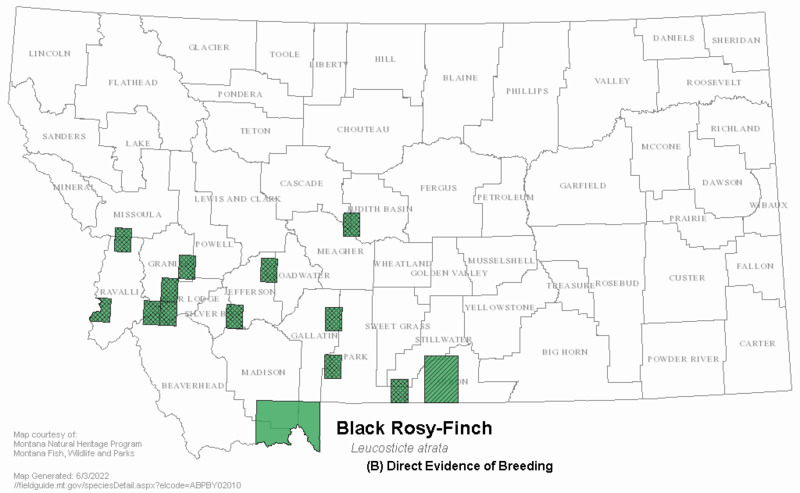 Most Black Rosy-finches breeding in Montana move out of the state an undetermined distance during winter (Johnson 2002). Habitat use in Montana has not been studied, but is similar to other regions (P. Hendricks, personal observation), where Black Rosy-Finches are known to nest in crevices in cliffs and talus among glaciers and snowfields above timberline (also possibly in abandoned buildings above treeline) and forage in barren, rocky or grassy areas adjacent to the nesting sites; in migration and winter they also occur in open situations, fields, cultivated lands, brushy areas, and around human habitation (American Ornithologists' Union 1983, Johnson 2002). They may roost in mine shafts or similar protected sites. During some winters individuals move out onto the shortgrass and midgrass prairies to feed (Hendricks and Swenson 1983, Johnson 2002). Black Rosy-Finches forage on the ground for seeds. In the spring and summer they glean wind-transported insects from the snow. Later in the season they glean insects from vegetation and catch flying insects, as well as continuing to feed on seeds. Winter foods include seeds taken from the ground, from stalks protruding through the snow, and at bird feeders (Johnson 2002). Males typically outnumber females in breeding and wintering populations. During the breeding season males defend a "territory" around the female wherever she moves (Ryser 1985, Johnson 2002). Black Rosy-Finches are commonly found in large flocks when not breeding, sometimes in flocks composed of other rosy-finch species. Little information is available for Montana as few nests have been discovered. Nest dates for Montana may be similar to those for Wyoming which occur from July 1 to August 11 (Johnsgard 1986). Young have been observed in July just post-fledging (Davis 1961). In general, clutch size is usually 4 to 5, sometimes 3 or 6 (based on 13 nests). Incubation, by the female alone, lasts 12 to 14 days. Both adults tend the young until they fledge at about 20 days of age. After nest departure the young remain with the parents for another 14 days (Johnson 2002). No special management action appears to be required at this time. Davis, C.V. 1961. A distributional study of the birds of Montana. Ph.D. dissertation. Oregon State University, Corvallis. 462 pp. Hendricks, P. and J. Swenson. 1983. 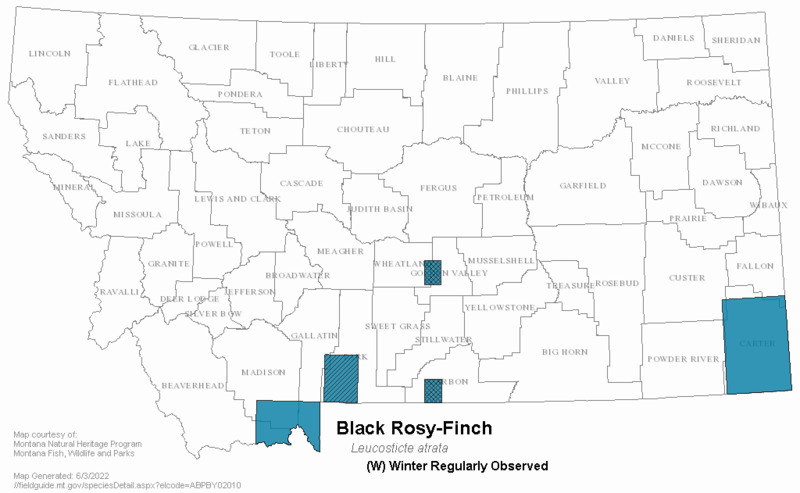 Dynamics of the winter distribution of rosy finches, Leucosticte arctoa, in Montana. Canadian Field-Naturalist 97(3): 307-310. Johnsgard, P.A. 1986. Birds of the Rocky Mountains: with particular reference to national parks in the northern Rocky Mountain region. Colorado Associated University Press, Boulder, CO.
Ryser, F.A. 1985. Birds of the Great Basin: a natural history. University of Nevada Press, Reno. 640 pp. American Ornithologists Union. 1983. Checklist of North American birds, 6th Edition. 877 PP. Casey, D. 2000. Partners in Flight Draft Bird Conservation Plan Montana. Version 1.0. 287 pp. Clement, P. 1993. Finches and sparrows: an identification guide. Princeton Univ. Press, Princeton. 500 pp. French, N.R. 1959a. 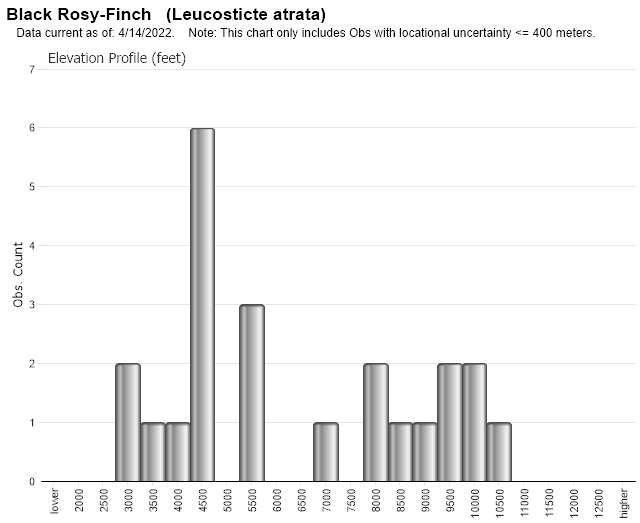 Life history of the Black Rosy Finch. Auk 76: 159-180. French, N.R. 1959b. 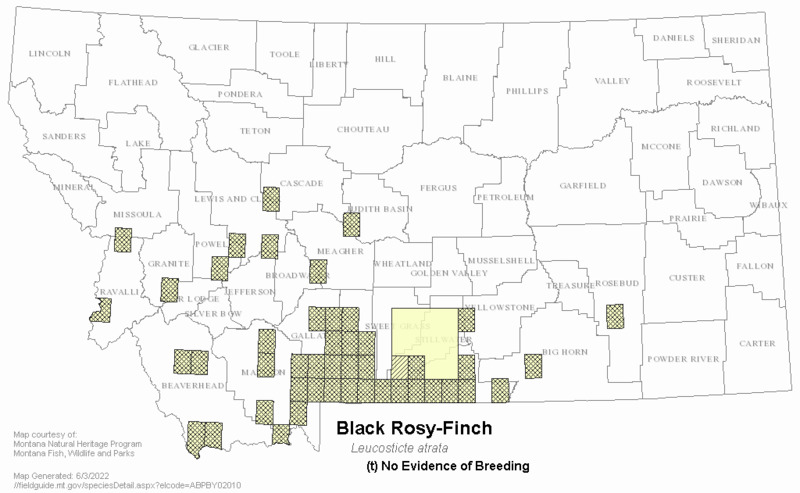 Distribution and migration of the Black Rosy Finch. Condor 61(1): 18-29. Johnson, R. E. 1972. The biosystematics of the avian genus Leucosticte. Ph.D. dissertation, University of California, Berkeley. Salt, W.R. and J.R. Salt. 1976. The birds of Alberta. Hurtig Publishers, Edmonton, Alberta. xv + 498 pp. Sibley, C.G., and B. L. Monroe. 1990. Distribution and taxonomy of birds of the world. Yale Univ. Press, New Haven. xxiv + 1111 pp. Swenson, J.E., K.C. Jensen and J.E. Toepfer. 1988. 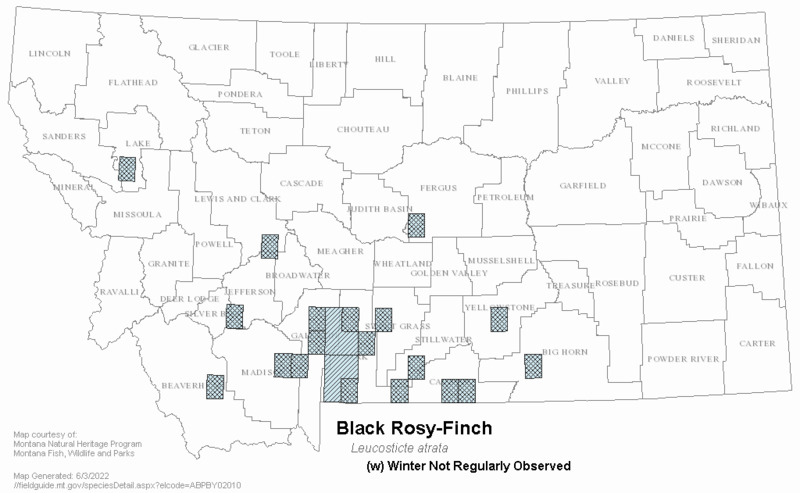 Winter movements by rosy finches in Montana. Journal of Field Ornithology 59(2): 157-160. Wright, P.L. 1996. 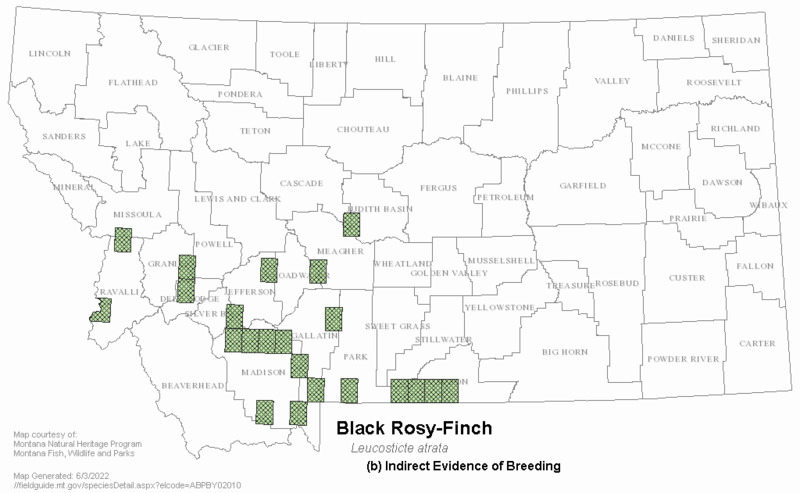 Status of rare birds in Montana, with comments on known hybrids. Northwestern Naturalist 77(3):57-85. Web Search Engines for Articles on "Black Rosy-Finch"